WAS YAKUBU MAMBO THE NATIONAL STADIUM’S FIRST SCORER? It is 46 years this Tuesday when the current descript National Stadium was inaugurated by the then Head of State, General Yakubu Gowon. It is on record that at the inauguration, Nigeria beat Mali 3-0. 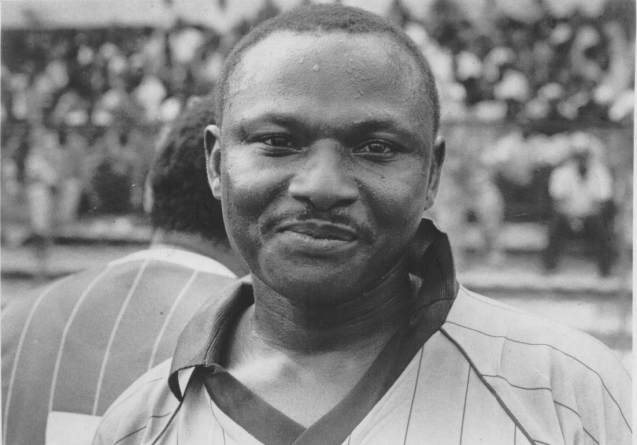 Scorer of the first goal was Yakubu Mambo who thus entered the record books as the first to find the net at the stadium. But to purists, this opens a debate thus Mambo may not be the first score. Before the existing National Stadium, there was an older structure built in 1960 on the same ground. It was called the Temporary National Stadium and was venue of the sporting activities to mark Nigeria’s independence took place in October 1960. The old structure was pulled down some months later. The Temporary National Stadium was the venue of the replay of the final match of 1961 Challenge Cup in which Ibadan beat Lagos UAC 1-0 on October 7. It was the first time the final of the national competition outside its birth place, the waterfront Lagos City Stadium, formerly known as Association Ground, then KGV Stadium and now Onikan Stadium. The foundation stone of the present National Stadium was laid by General Gowon in 1970. At the old National Stadium, the first official match was the October 2, 1960 semi-finals of the Kwame Nkrumah Cup that pitched Nigeria against Portuguese Guinea which is now Guinea Bissau. Nigeria won 4-1. But the very first goal of the match was scored by a Portuguese Guinea player, Ulisses Monteiro. He scored in the midst of confused Nigerian defence that made the visiting side to take a surprise 1-0 lead. Asuquo Ekpe later equalised for Nigeria in the second half before additional three goals were scored. So, on the old National Stadium, the Guinea Bissau player, Ulisses Monteiro could be regarded as the first scorer on the National Stadium turf. But that does not erase the fact that in the existing structure, Yakubu Mambo has the honour. Mambo died in December 1991.